Thank You From Five Pawns Inc. Thanks to our Five Pawns community and fantastic authorized retail partners for the support you provide. 2016 has been a record-breaking year for us so far and we’re grateful you’ve been along for the ride. We want to update you on the incredible milestones we’ve been able to reach thus far with you by our side. Your response to our latest CLR edition blew us away. In the first 24 hours it was available online, we shipped 23% more than last year’s edition. We’re thrilled that this masterful blend is being so well received. As the first and only double barrel liquid, Double Barrel Castle Long Reserve - Edition V - offers a complex flavor profile of toasted coconut, roasted almond, brown sugar, Madagascar vanilla bean, French vanilla, Kentucky bourbon, and two distinct oaks. Our customers asked and we listened. Our new lifestyle brand Taken Three is about providing a different experience to a broader market. In just the first two weeks of its launch (and pre-sale), Taken Three has opened 30% more retail locations. Look for it near you starting April 2016. 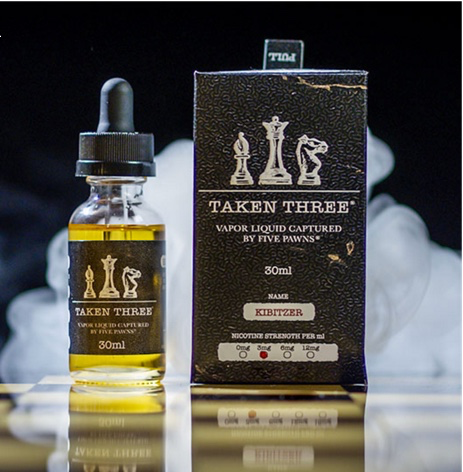 Taken Three showcases delicious, approachable all-day blends at an all day price, like glazed lemon zest sugar cookie, grilled pineapple upside-down cake, and banana Boston cream pie. These blends have higher VG concentrations and are executed without the use of artificial sweeteners. If you’re just trying out our products, we’re grateful to have you as part of the Five Pawns community. And if you’ve been with us for the long haul, we can’t say thank you enough. Our pledge is to continue creating exceptional vapor liquids with complex and high-quality flavor profiles. We are always looking to evolve as a company, and we want to acknowledge and thank you for your constant support during the journey. 2016 is just getting started, and we can’t wait for you to see what we have in store in the months to come. 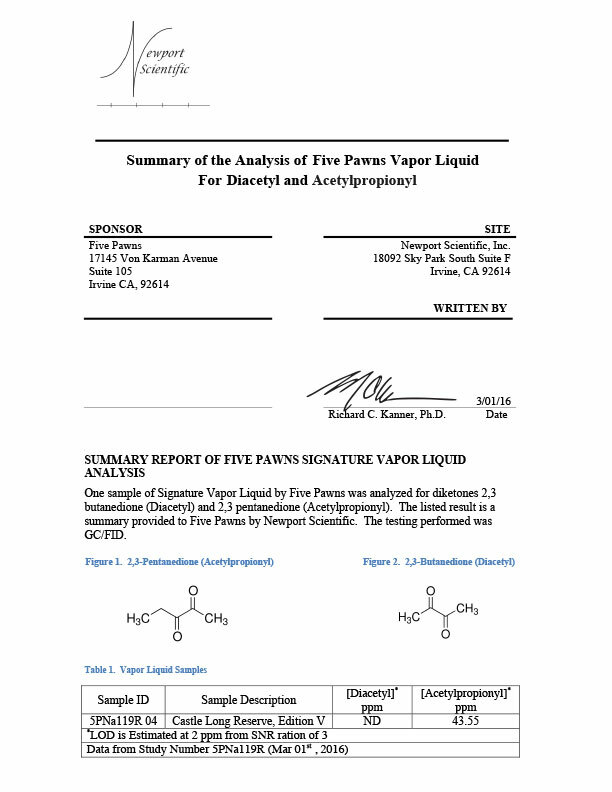 Five Pawns is pleased to release the latest test results on our current 10 vapor liquid flavors. From this date forward, we will be publishing test results quarterly on each flavor using bottles pulled randomly from the production line. We will also be releasing results on future product launches and limited edition flavor offerings prior to release. Testing was conducted using GC / FID and detection levels were set at 5 ppm (parts per million). 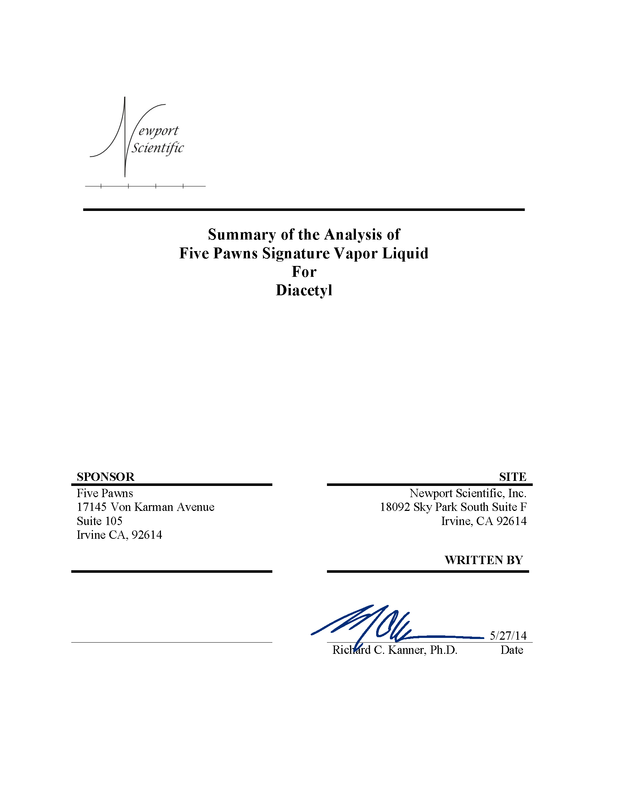 While there is currently no standardized or approved methodology for testing e-liquids, Five Pawns is committed to working with the industry to develop a standard methodology by which all e-liquids can be tested and held accountable. Since our founding in 2012, we have been dedicated to creating the highest quality vapor liquids with the most complex flavor profiles on the market. As the past 12 months of test results show, we are always innovating and will continue to evolve our products with ongoing testing, research and development to provide a viable alternative for those wanting a pleasurable vice with less consequence. 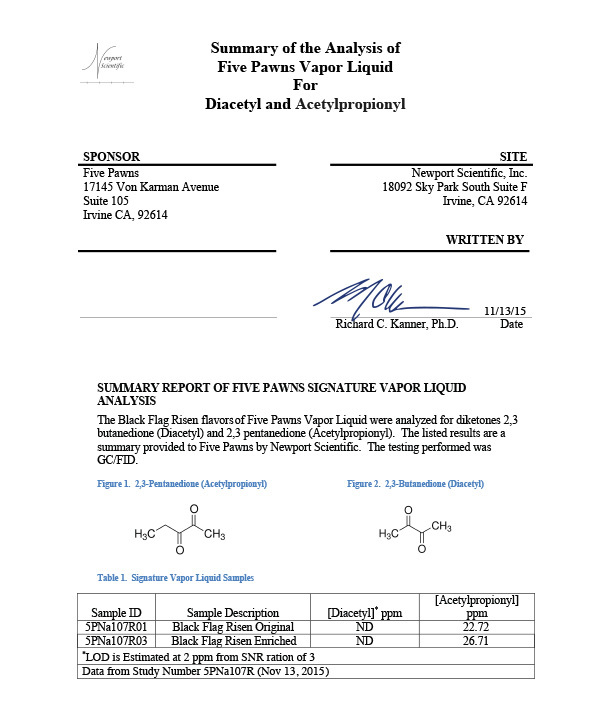 Five Pawns is pleased to release the latest test results of our newest flavor Symmetry Six. Testing was conducted using GC / FID and detection levels were set at 2 ppm (parts per million). While there is currently no standardized or approved methodology for testing e-liquids, Five Pawns is committed to working with the industry to develop a standard methodology by which all e-liquids can be tested and held accountable. View Symmetry Six test results here or view images here: Page 1, Page 2. 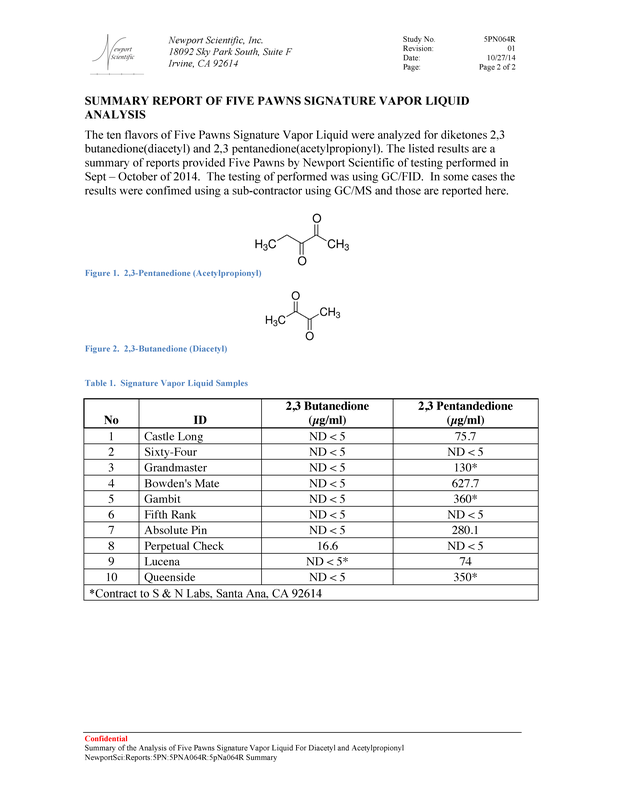 VIEW FIVE PAWNS 3Q 2015 & PAST 12 MONTHS TEST RESULTS or view images here: Page 1, Page 2. 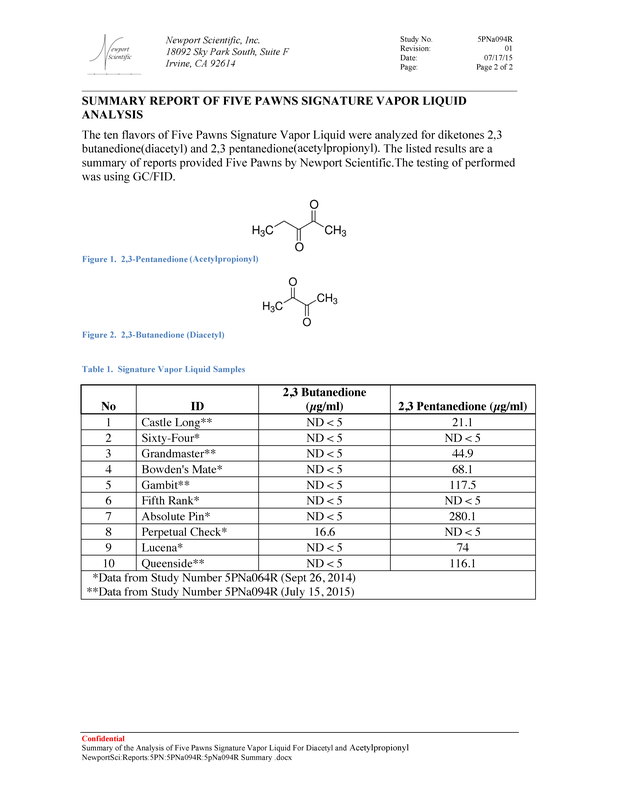 VIEW FIVE PAWNS 2014 TEST RESULTS HERE or view images here: Page 1, Page 2. 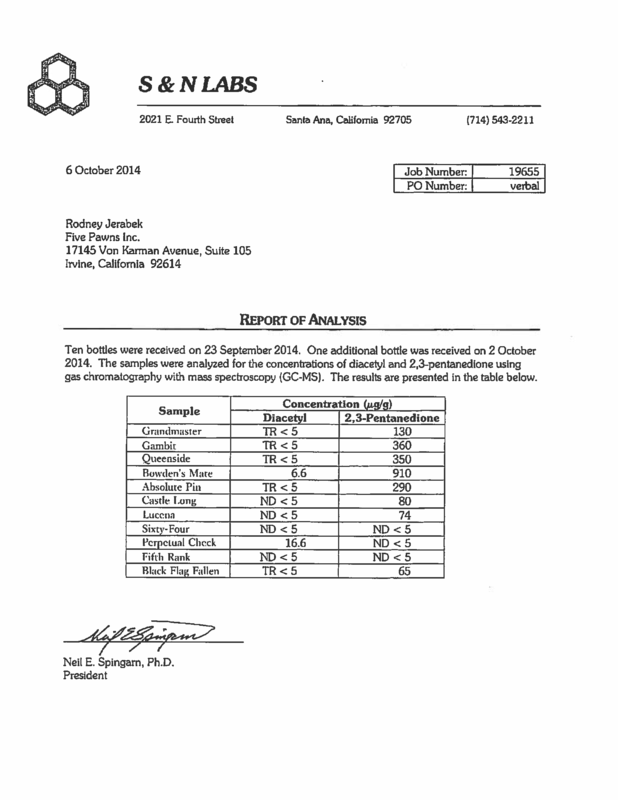 VIEW OUR 2014 DIACETYL TEST RESULTS HERE or view images here: Page 1, Page 2. VIEW OUR 2014 INDEPENDENT TEST RESULTS HERE or view as an image here: Page 1. 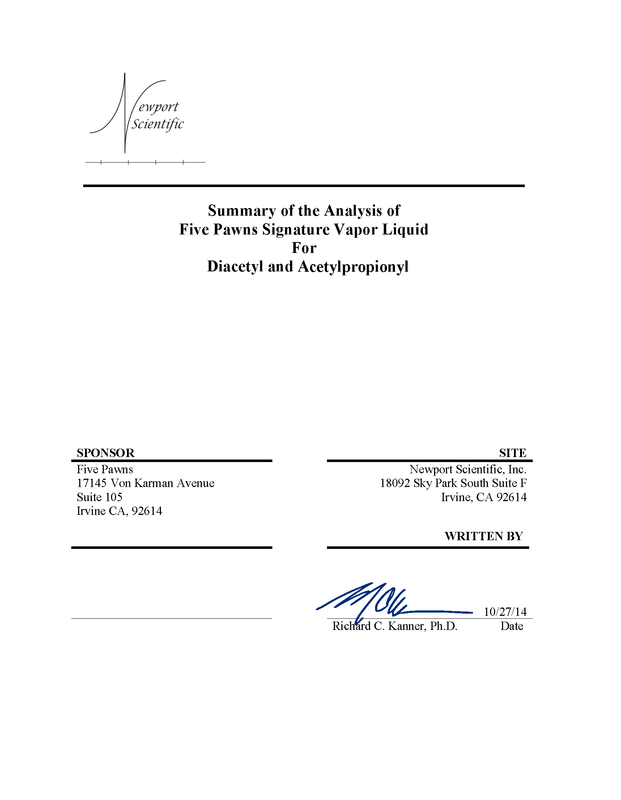 As a pioneer in the vapor liquid industry, Five Pawns is committed to the quality of our vapor liquids. Our vision has always been long-term. We founded and built our company on the principle that one day, FDA regulation and approval would be a requirement for our products. We are poised and ready to comply with this standard if and when the time comes. 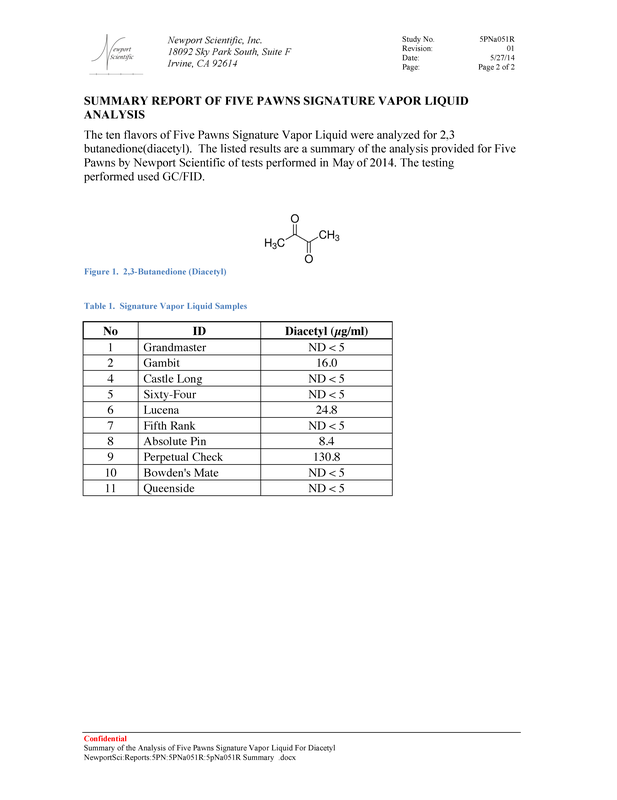 There is currently no standardized or approved methodology for testing e-liquids. That needs to change. We want to assure our retailers and customers that Five Pawns is 100% dedicated to working to develop a standard methodology by which all e-liquids can be tested and held accountable. View the RPadTV interview with Rodney Jerabek from ECC 2014. In it he shares exclusive details about Black Flag Fallen, Five Pawns’ latest flavor scheduled to hit select retail locations on Friday, Dec 12. Listen to a segment from New Hampshire Public Radio where Leah Sottile, author of The Atlantic article “The Right to Vape,” discusses how Five Pawns’ artisanal qualities changed the vaping industry. 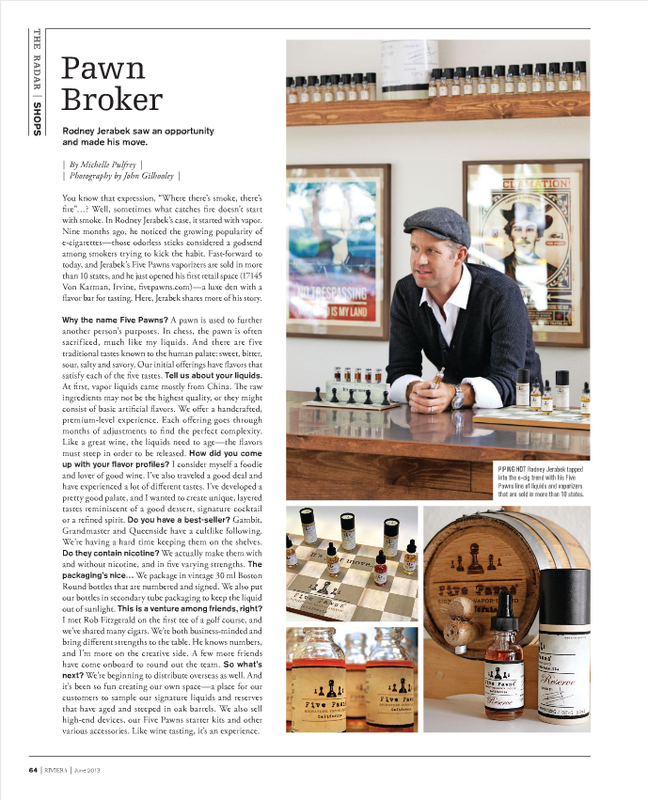 You’ll also hear soundbites from Rodney Jerabek, Five Pawns CEO. Castle Long Reserve will be available at participating authorized retailers on August 1st, 2014 and may be found online with said retailers. Most stores that will have CLR will be willing to ship nationwide as of that date (many are even taking pre-orders now). 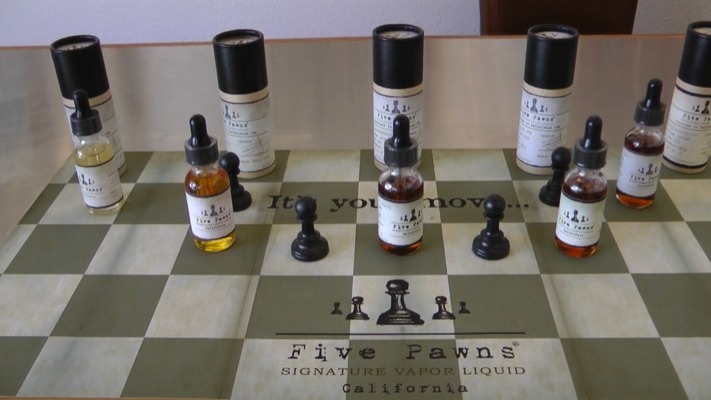 Five Pawns lets our retail partners have all the fun while it’s in stock. 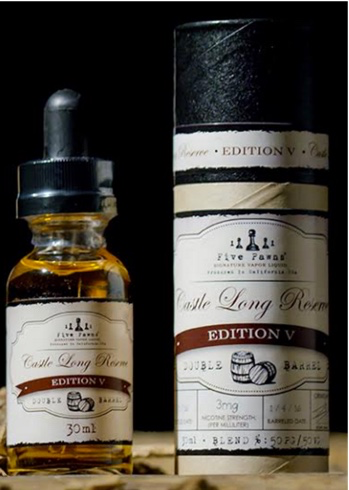 Therefore, Castle Long Reserve will not be available on fivepawns.com until a bit later in the fall. We will make announcements when it’s available for purchase on our site and thank you for your support. Monday, May 19th, 2014, we lost a father. He was our mentor, advisor, a dear friend, and Five Pawns’ biggest fan. 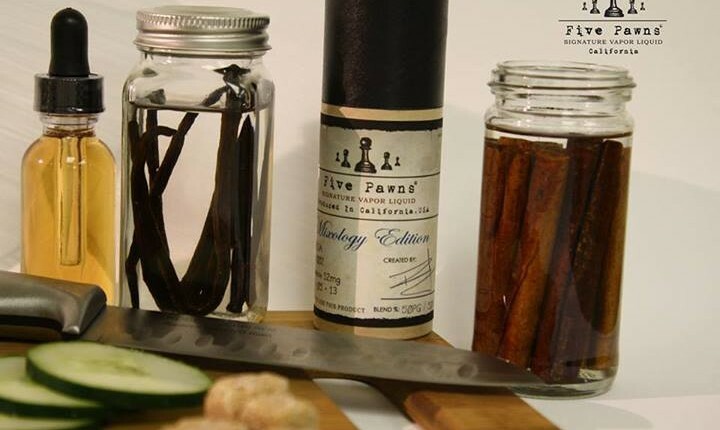 His counsel and leadership was respected and revered in the global business arena, especially here at Five Pawns, Inc.
Five Pawns does something few mixologists in the industry can do. They near-perfectly blend a wide variety of flavors, some that seemingly wouldn’t work well in a mix, in some of the most unique concoctions imaginable. Not only that, but they seem to have the ability to take flavors you wouldn’t normally enjoy and mix them into a mouth-watering and savory vape. While the price of each bottle may deter some, let me tell you, it’s well worth it. When I first started vaping, I was paying $10 for 10ml of something like an RY4, and that was about as complex as it got. There’s nothing wrong with ordering a month’s supply of dirt cheap e-liquid online, so long as it keeps you from smoking. 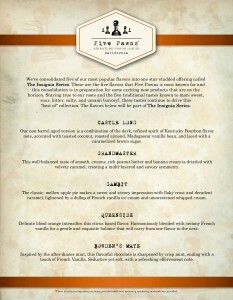 Five Pawns is for the flavor connoisseur, the vaper who’s tried the rest, but is continually looking for the best. Where do you want Five Pawns to go to next? North Carolina, Washington State, Texas, Oklahoma are 4 locations selected for early 2014. Do you want Five Pawns to visit your area? Let us know in the comments. We were lucky to be a part of the Onyx launch party at Marquee in Las Vegas. Thanks to Surefire Vapor and VapeRev for getting us involved. Enjoy these great pics from the event! By popular demand, I’ve added a list of all liquids that received “Street Shout Out”. You’ll see it over to the right under the Information section. Many thanks to Lynn and Bud for searching through my videos and compiling this for me. If I’ve missed any, please let me know. In the ECC Pt. 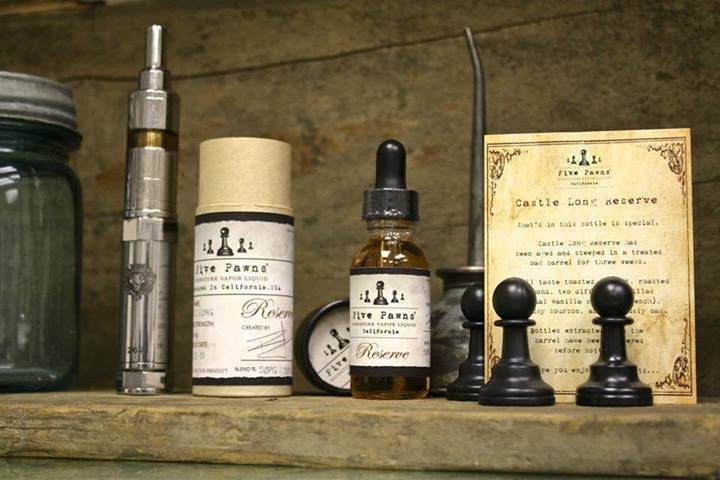 2 video, we talked to the folks from Five Pawns and we tried their Castle Long Reserve. It didn’t get a “Street Shout Out” because the Throat Hit (TH) was a little weak. Problem is, I’ve been vaping it. A lot. Like a real lot. Finally last night I put it in my Russian (you know, the one with the new micro coil) and I got a very satisfying throat hit off of it. After our first successful road trip to Northern California we decided to take Five Pawns on the road to Vegas. Soon to be visiting Washington, Texas and Oklahoma. Stay tuned for more coverage. The 2nd Release of Castle Long Reserve is now officially steeping in the barrel. We are planning to begin shipping to retail locations nationwide the week of October 28th. After our first successful road trip to Northern California we decided to take Five Pawns on the road to Vegas. Soon to be visiting Washington, Texas and Oklahoma. Stay tuned for more coverage and Part II of Vegas. 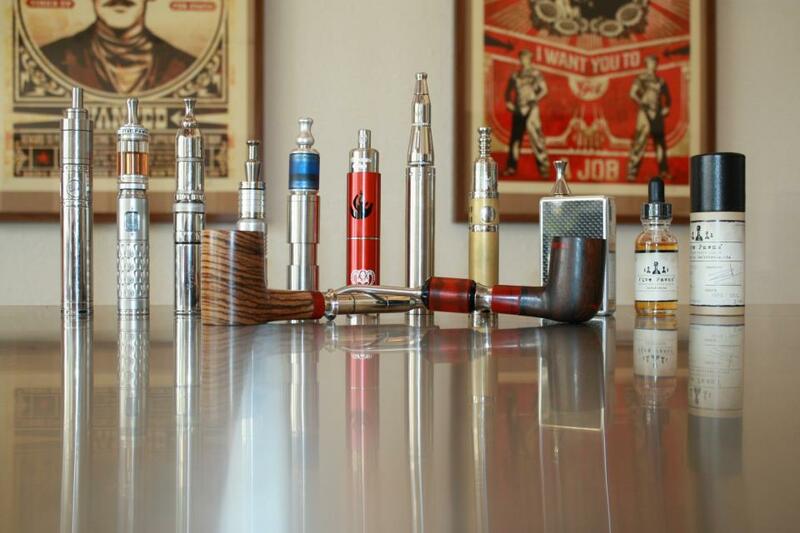 The early days of e-cigarettes saw a plethora of flavors hitting the market. Watermelon, Apple, Blueberry, Vanilla and wild flavors like Gummy Bear, or even Waffles and Syrup. While sweet flavors pleased many there was a segment of the vape community that had moved away from the tobacco type flavors yet longed for something different, a taste that grown ups would enjoy. Five pawns burst on the scene a few months ago with a line up of mature, extraordinary flavors that one user described as better than the finest of fine cigars. A blend of almost savory refined flavors with a touch of sweetness. 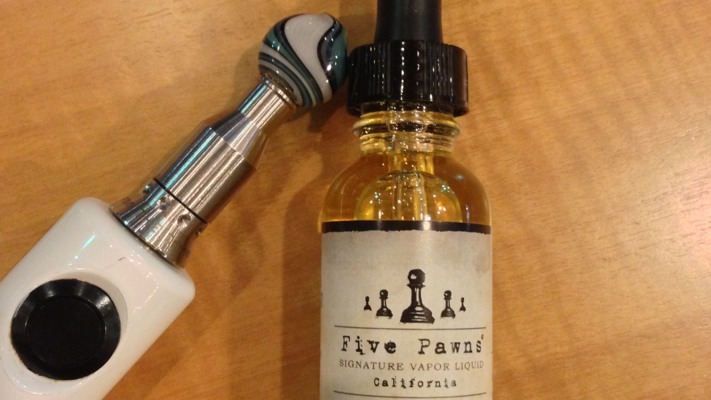 Smoke Free Source and Five Pawns teamed up in a documentary and product giveaway. Please share the video and comment with the flavor and nicotine strength and the winners will be sent free bottles of Five Pawns. You can see the documentary and details here! 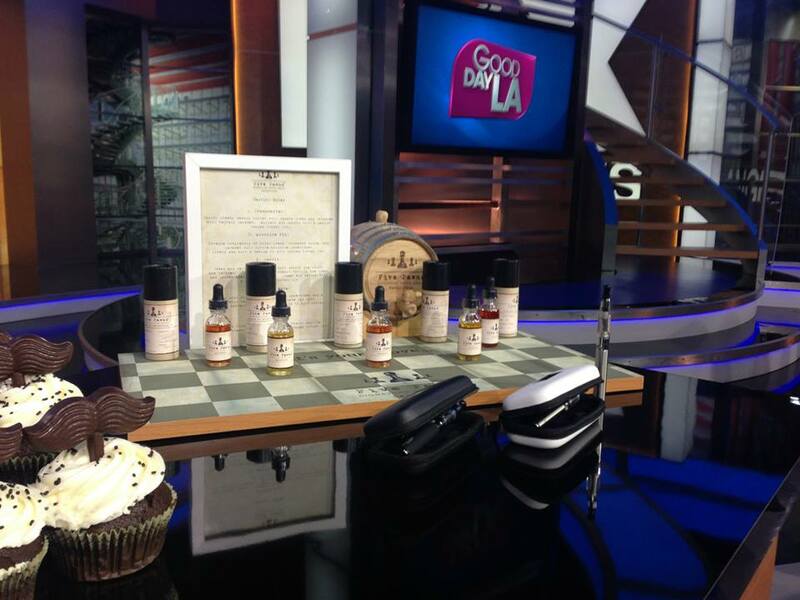 Here is a little taste of our first TV appearance on Good Day LA! You can also see a segment here. Free International Shipping on Orders of 5 or more! Five Pawns now offers FREE INTERNATIONAL SHIPPING on orders of 5 or more. Please check with your country to see if importing nicotine products is legal. If we do not have you on the list. please email us! The Flagship Five Pawns Tasting Bar is now Open! Flagship Store Interior Done…Opening Date Coming Soon…. The Five Pawns Official Site is Live! 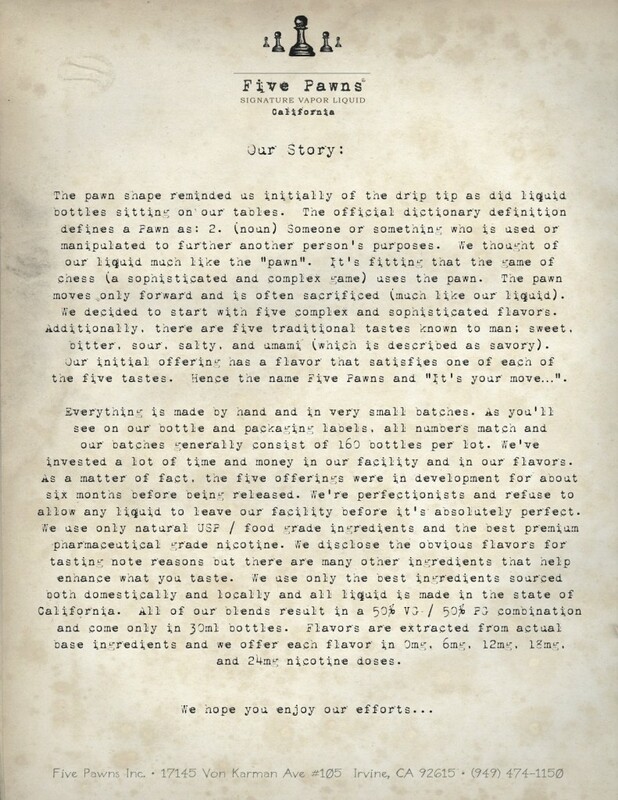 Hear the Five Pawns executive team discuss their manufacturing process to ensure the utmost in quality for every bottle of Five Pawns Signature Vapor Liquid.